Representing a diverse cross-section of Sting's enduring solo career, 'Sting: The Best Of 25 Years', is released internationally today, October 24. The US version is comprised of 12 remastered songs and the International releases will be available as both a single-disc containing 13 remastered tracks and a double-disc comprised of 31 remastered songs, all featuring several remixes and newly unearthed live recordings. Highlights include the No. 1 hits 'If You Love Somebody Set Them Free' and 'All This Time', as well as Grammy winners 'If I Ever Lose My Faith In You' and 'Whenever I Say Your Name' featuring Mary J. Blige. The CD also includes a new mix of 'Never Coming Home' as well as previously unreleased live versions of 'Message In A Bottle', 'Demolition Man' and 'Heavy Cloud No Rain' (full 'track listing included below). 'Sting: The Best Of 25 Years' was produced by Rob Mathes and Executive Produced by Sting's longtime manager, Kathryn Schenker. 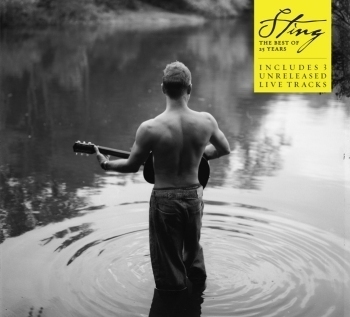 Also recently announced, Sting: 25 Years, the definitive box set, was released internationally on September 26. This consummate collection contains three comprehensive CDs personally curated by Sting, as well as a DVD, 'Rough, Raw & Unreleased: Live At Irving Plaza', featuring previously unreleased live concert footage filmed at New York City's Irving Plaza. The discs are housed in a beautiful, hardcover book containing rare photos, complete lyrics, and newly written commentary by Sting. Embodying the highlights and rarities of his illustrious solo career, 'Sting: The Best Of 25 Years' and 'Sting: 25 Years' celebrate the distinctive work of one of the world's most renowned artists. Love the int'l double set! 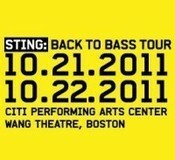 Will be there Saturday. Cheers. p.s. Are the ripples on the lake created by yoda-ish effect of the vox or the shirtless demeanor :-)? Why no double disc U.S. version? The book of my life, I hung my head, Valparaiso...? All the chosen ones are great, but the 'fore mentioned are personally perennially meaningful to me. are the 3 live tracks on the big box set or do I have to buy this CD too to get the 3 tracks?